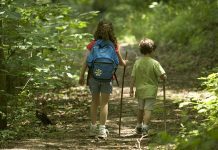 Losing your footing and falling while hiking is probably the most common type of injury hikers can succumb to on a hike. There are many ways a hiker can lose his balance and take a plunge. I know I’ve tripped on roots more times than I can count, but always seem to catch my balance before I fall. Slippery rocks is another big one, they don’t even have to be wet either. They can have a just little bit of mud or moss on them, that’s all it takes. 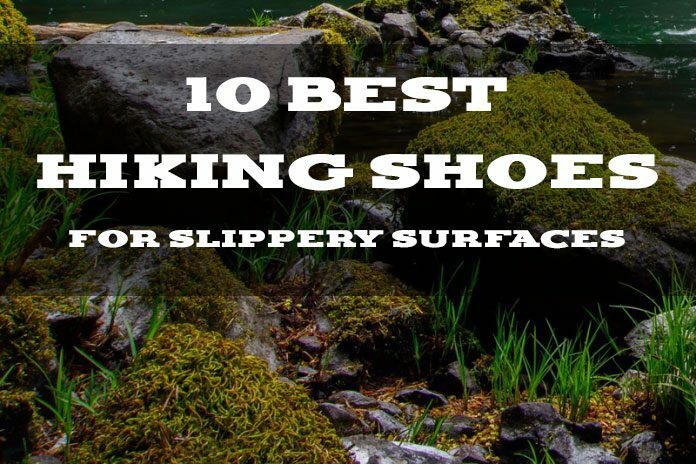 In this article I’ll go over some of the best hiking shoes for slippery surfaces so you can be prepared. When I think of hiking shoes I usually think of Merrell, and when I think of Merrell I usually think of the MOAB 2 hiking shoes. These waterproof hiking shoes from Merrell provide great traction on slippery surfaces, look great, and are fine for wearing everyday as well. Salomon brings hiking shoes and trail runners together in the X Ultra 2 GTX hiking shoe. The shoe is extremely lightweight weighing in at just 14.5oz, compared to the Merrell MOAB above which are 17.6oz . The super light-weight of these shoes contributes to how comfortable they are on your feet. In addition, they look pretty cool and are very popular on Amazon. The AX2 from Adidas are a contender as well. They have over 1200 5 star reviews on Amazon and are very popular. These are a bit cheaper than the 2 above, but aren’t waterproof either. Many Amazon reviewers have had good luck with the durability of Adidas hiking shoes, but I’ll personally be sticking to Merrell or Salomon. Camel Crown makes hiking and outdoor adventure shoes that are specifically designed for being slip resistant. That doesn’t mean the others on this list that don’t say slip-resistant in the name are less so, however. These just advertise that feature. 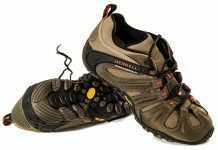 Despite their low price compared to some of the name brands like Merrell, Amazon reviewers praise their durability and overall quality. Definitely more of a generic hiking shoe, these anti-slip men’s hiking shoes might work for you if you’re on a budget. 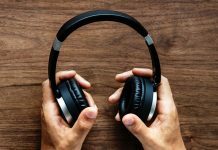 Although if you want something that is proven and going to withstand the test of time and some long hikes, you might consider another option. These would work great as a backup pair. Here’s a third low-cost option for non-slip hiking shoes for you. The Knixmax are very versatile and can be used for a variety of outdoor activities including hiking, camping, trekking, casual walking, or climbing to name a few. Not a ton of customer reviews yet on this shoe but the few it does have are all positive. I thought it prudent to put another choice on this list by Salomon, they make amazing, lightweight hiking shoes afterall. Just a tiny bit heavier than the Salomon X Ultra 2 weighing right at a pound, still very lightweight though. Design and style looks very similar to the Ultra 2 as well. Another great hiking shoe by Saloman. Keen is another name brand hiking shoe that have been on the scene for a while. They make high quality hiking shoes and they look great too. The Targhee 2 are all around great hiking shoes and made to take a beating. The toe box gives added toe protection out on the trails and the aggressive lug pattern makes for some high traction hiking. I find these really intriguing, basically a hybrid between a hiking shoe and a water shoe… and they’re made by Merrell. They look great and perform well on all manny of terrain and slippery surfaces. Also, these are by far the lightest weight shoes on this list. I foresee these in my closet very soon! Another hiking shoe option from KEEN. Many of the same features as the Targhee above, with a slightly different look. The Targhee seemed to be a little more highly regarded among Amazon reviewers and are water resistant, where the Voyageurs are not. Finding the best hiking shoes for slippery surfaces is a very specific use case. Most hiking shoes have plenty of tread and are pretty grippy in most cases. However, some hiking shoes are targeted specifically at being slip-resistant or anti-slip. For this hiker, I like the Merrell Waterproof MOAB 2 for an all around best hiking shoe for slippery surfaces and the Merrell Blaze Aero as a close second, because you can actually wear it directly in the water on wet rocks. The 2 hiking shoe options from Salomon would also make excellent choices, but any of the others on this list would get the job done. Those are just my top picks. Next articleWhen Do Rhododendrons Bloom In the Smokies?